For the 1991 treaty, see 1991 Paris Peace Accords. The Paris Peace Accords, officially titled the Agreement on Ending the War and Restoring Peace in Vietnam, was a peace treaty signed on January 27, 1973 to establish peace in Vietnam and end the Vietnam War. The treaty included the governments of the Democratic Republic of Vietnam (North Vietnam), the Republic of Vietnam (South Vietnam), and the United States, as well as the Provisional Revolutionary Government (PRG) that represented indigenous South Vietnamese revolutionaries. It ended direct U.S. military combat, and temporarily stopped the fighting between North and South Vietnam. However, the agreement was not ratified by the United States Senate. The negotiations that led to the accord began in 1968, after various lengthy delays. As a result of the accord, the International Control Commission (ICC) was replaced by the International Commission of Control and Supervision (ICCS) to fulfill the agreement. The main negotiators of the agreement were United States National Security Advisor Henry Kissinger and Vietnamese politburo member Lê Đức Thọ; the two men were awarded the 1973 Nobel Peace Prize for their efforts, although Lê Đức Thọ refused to accept it. The approximate areas of control at the time of the signing of the Accord. 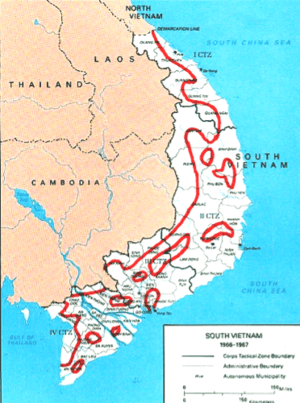 The South Vietnamese government controlled about 80 percent of the territory and 90 percent of the population, although many areas were contested. Following the success of anti-war candidate Eugene McCarthy in the New Hampshire primary, in March 1968 U.S. President Lyndon B. Johnson halted bombing operations over the northern portion of the North Vietnam (Operation Rolling Thunder), in order to encourage Hanoi (the perceived locus of the insurgency) to begin negotiations. Shortly thereafter, Hanoi agreed to discuss a complete halt of the bombing, and a date was set for representatives of both parties to meet in Paris, France. The sides first met on May 10, with the delegations headed by Xuân Thuỷ, who would remain the official leader of the North Vietnamese delegation throughout the process, and U.S. ambassador-at-large W. Averell Harriman. For five months, the negotiations stalled as North Vietnam demanded that all bombing of North Vietnam be stopped, while the U.S. side demanded that North Vietnam agree to a reciprocal de-escalation in South Vietnam; it was not until October 31 that Johnson agreed to end the air strikes and serious negotiations could begin. One of the largest hurdles to effective negotiation was the fact that North Vietnam and its ally in South Vietnam, the National Front for the Liberation of South Vietnam (NLF, or Viet Cong), refused to recognize the government of South Vietnam; with equal persistence, the government in Saigon refused to acknowledge the legitimacy of the NLF. Harriman resolved this dispute by developing a system by which North Vietnam and U.S. would be the named parties; NLF officials could join the North Vietnam team without being recognized by South Vietnam, while Saigon's representatives joined their U.S. allies. A similar debate concerned the shape of the table to be used at the conference. The North favored a circular table, in which all parties, including NLF representatives, would appear to be "equal"' in importance. The South Vietnamese argued that only a rectangular table was acceptable, for only a rectangle could show two distinct sides to the conflict. Eventually a compromise was reached, in which representatives of the northern and southern governments would sit at a circular table, with members representing all other parties sitting at individual square tables around them. Bryce Harlow, a former White House staff member in the Eisenhower administration, claimed to have "a double agent working in the White House....I kept Nixon informed." Harlow and Henry Kissinger (who was friendly with both campaigns and guaranteed a job in either a Humphrey or Nixon administration in the upcoming election) separately predicted Johnson's "bombing halt". Democratic senator George Smathers informed President Johnson that "the word is out that we are making an effort to throw the election to Humphrey. Nixon has been told of it". According to presidential historian Robert Dallek, Kissinger's advice "rested not on special knowledge of decision making at the White House but on an astute analyst's insight into what was happening." CIA intelligence analyst William Bundy stated that Kissinger obtained "no useful inside information" from his trip to Paris, and "almost any experienced Hanoi watcher might have come to the same conclusion". While Kissinger may have "hinted that his advice was based on contacts with the Paris delegation," this sort of "self-promotion...is at worst a minor and not uncommon practice, quite different from getting and reporting real secrets." Nixon asked the prominent Asian-American politician Anna Chennault to be his "channel to Mr. Thieu"; Chennault agreed and periodically reported to John Mitchell that Thieu had no intention of attending a peace conference. On November 2, Chennault informed the South Vietnamese ambassador: "I have just heard from my boss in Albuquerque who says his boss [Nixon] is going to win. And you tell your boss [Thieu] to hold on a while longer." In response, President Johnson ordered the wire-tapping of members of the Nixon campaign. Dallek wrote that Nixon's efforts "probably made no difference" because Thieu was unwilling to attend the talks and there was little chance of an agreement being reached before the election; however, his use of information provided by Harlow and Kissinger was morally questionable, and vice president Hubert Humphrey's decision not to make Nixon's actions public was "an uncommon act of political decency." After winning the 1968 presidential election, Richard Nixon became president of the U.S. in January 1969. He then replaced U.S. ambassador Harriman with Henry Cabot Lodge Jr., who was later replaced by David Bruce. Also that year, the NLF set up a Provisional Revolutionary Government (PRG) to gain government status at the talks. However, the primary negotiations that led to the agreement did not occur at the Peace Conference at all, but were carried out during secret negotiations between Kissinger and Lê Đức Thọ, which began on August 4, 1969. North Vietnam insisted for three years that the agreement could not be concluded unless the United States agreed to remove South Vietnamese President Nguyễn Văn Thiệu from power and replace him with someone more acceptable to Hanoi. Nixon and Kissinger were unwilling to sign an agreement to overthrow a government the NLF had failed to overthrow by force of arms, though the extent of North Vietnamese demands is contested. Historian Marilyn B. Young, whose expertise is in American foreign relations, contends that the contents of Hanoi's proposal were systematically distorted from their original plea to permit Thiệu's replacement, to what Kissinger propagated as a demand for his overthrow. On May 8, 1972, President Nixon made a major concession to North Vietnam by announcing that the U.S. would accept a cease-fire in place as a precondition for its military withdrawal. In other words, the U.S. would withdraw its forces from South Vietnam without North Vietnam doing the same. The concession broke a deadlock and resulted in progress in the talks over the next few months. The final major breakthrough came on October 8, 1972. North Vietnam had been disappointed by the results of its Nguyen Hue Offensive (known in the West as the Easter Offensive), and feared increased isolation if Nixon's efforts at détente significantly improved U.S. relations with the chief communist powers, the Soviet Union and the People's Republic of China, who were backing the North Vietnamese military effort. In a meeting with Kissinger, Thọ significantly modified his bargaining line, allowing that the Saigon government could remain in power and that negotiations between the two South Vietnamese parties could develop a final settlement. Within 10 days the secret talks drew up a final draft. Kissinger held a press conference in Washington during which he announced that "peace is at hand." When Thiệu, who had not even been informed of the secret negotiations, was presented with the draft of the new agreement, he was furious with Kissinger and Nixon (who were perfectly aware of South Vietnam's negotiating position) and refused to accept it without significant changes. He then made several public radio addresses, claiming that the proposed agreement was worse than it actually was. Hanoi was flabbergasted, believing that it had been duped into a propaganda ploy by Kissinger. On October 26, Radio Hanoi broadcast key details of the draft agreement. However, as U.S. casualties mounted throughout the conflict, American domestic support for the war had deteriorated, and by 1972 there was major pressure on the Nixon administration to withdraw from the war. Consequently, the U.S. brought great diplomatic pressure upon their South Vietnamese ally to sign the peace treaty even if the concessions Thiệu wanted could not be achieved. Nixon pledged to provide continued substantial aid to South Vietnam, and given his recent landslide victory in the presidential election, it seemed possible that he would be able to follow through on that pledge. To demonstrate his seriousness to Thiệu, Nixon ordered the heavy Operation Linebacker II bombings of North Vietnam in December 1972. Nixon also attempted to bolster South Vietnam's military forces by ordering that large quantities of U.S. military material and equipment be given to South Vietnam from May to December 1972 under Operations Enhance and Enhance Plus. These operations were also designed to keep North Vietnam at the negotiating table and to prevent them from abandoning negotiations and seeking total victory. When the North Vietnamese government agreed to resume "technical" discussions with the United States, Nixon ordered a halt to bombings north of the 20th parallel on December 30. With the U.S. committed to disengagement (and after threats from Nixon that South Vietnam would be abandoned if he did not agree), Thiệu had little choice but to accede. On January 15, 1973, President Nixon announced a suspension of offensive actions against North Vietnam. Kissinger and Thọ met again on January 23 and signed off on a treaty that was basically identical to the draft of three months earlier. The agreement was signed by the leaders of the official delegations on January 27, 1973, at the Hotel Majestic in Paris, France. The Paris Peace Accords effectively removed the U.S. from the conflict in Vietnam. However, the agreement's provisions were routinely flouted by both the North Vietnamese and the Saigon government, eliciting no response from the United States, and ultimately resulting in the communists enlarging the area under their control by the end of 1973. North Vietnamese military forces gradually built up their military infrastructure in the areas they controlled, and two years later were in position to launch the successful offensive that ended South Vietnam's status as an independent country. At the time of the peace agreement the United States agreed to replace equipment on a one-by-one basis. But the United States did not keep its word. Is an American's word reliable these days? The United States did not keep its promise to help us fight for freedom and it was in the same fight that the United States lost 50,000 of its young men. Saigon fell to the North Vietnamese army supported by Viet Cong units on April 30, 1975. Schlesinger had announced early in the morning of April 29 the beginning of Operation Frequent Wind, which entailed the evacuation of the last U.S. diplomatic, military and civilian personnel from Saigon via helicopter, which was completed in the early morning hours of April 30. Not only did North Vietnam conquer South Vietnam, but the communists were also victorious in Cambodia when the Khmer Rouge captured Phnom Penh on April 17, as were the Pathet Lao successful in capturing Vientiane on December 2. Like Saigon, U.S. civilian and military personnel were evacuated from Phnom Penh, U.S. diplomatic presence in Vientiane was significantly downgraded, and the number of remaining U.S. personnel was severely reduced. ↑ The Paris Agreement on Vietnam: Twenty-five Years Later Conference Transcript, The Nixon Center, Washington, DC, April 1998. Reproduced on mtholyoke.edu. Accessed 5 September 2012. ↑ The Constitution - Executive agreements Accessed 29 July 2014. 1 2 Robert Dallek (2007), Nixon and Kissinger: Partners in Power, HarperCollins, pp. 73-74. ↑ Dallek, pp. 74-75. In 1997, Chennault admitted that "I was constantly in touch with Nixon and Mitchell." ↑ Marilyn Young (1994) The Vietnam Wars: 1945–1990, HarperPerennial, pp.263-264. ↑ "1975: Vietnam's President Thieu resigns". On this day. BBC News. April 21, 1975. Herrington, Stuart A. (1983). "Peace with Honor? An American Reports on Vietnam" Presidio Press. Part II, "Life Under The Paris Agreement" pp. 16–40. Herschensohn, Bruce (2010). An American Amnesia: How the U.S. Congress Forced the Surrenders of South Vietnam and Cambodia. New York: Beaufort Books. ISBN 978-0-8253-0632-7. “LBJ Tapes Implicate Nixon With Treason”. ABC News. December 5, 2008, (video). “The Trials of Henry Kissinger” documentary by Eugene Jarecki (video, 1h19). Sequence on Nixon campaign sabotage of Paris Peace Accords: start 15min 20sec – end 20min 10sec. “Les Accords de Paris, quarante ans plus tard, un film de Rina Sherman” documentary by Rina Sherman (HD, 71 min).